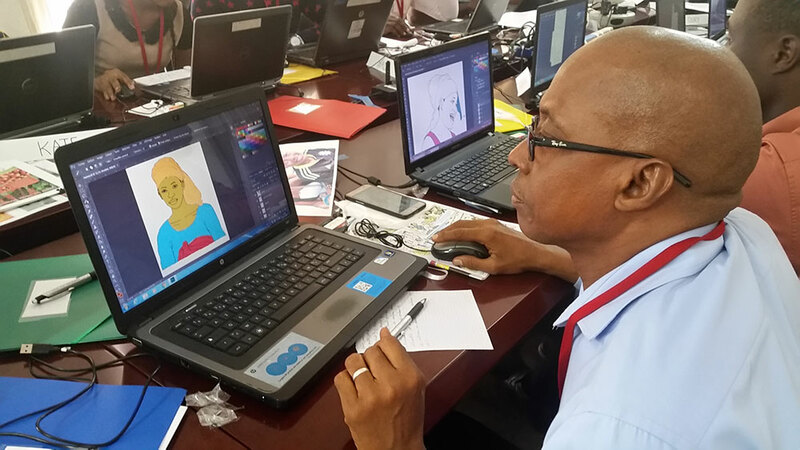 In July 2017, SPRING/Guinea held a six-day training with illustrators and the IT manager from Guinea and Sierra Leone, Peace Corps Guinea staff, and volunteers on a graphic design technique known as the Photo-to-Illustration (PTI) process. 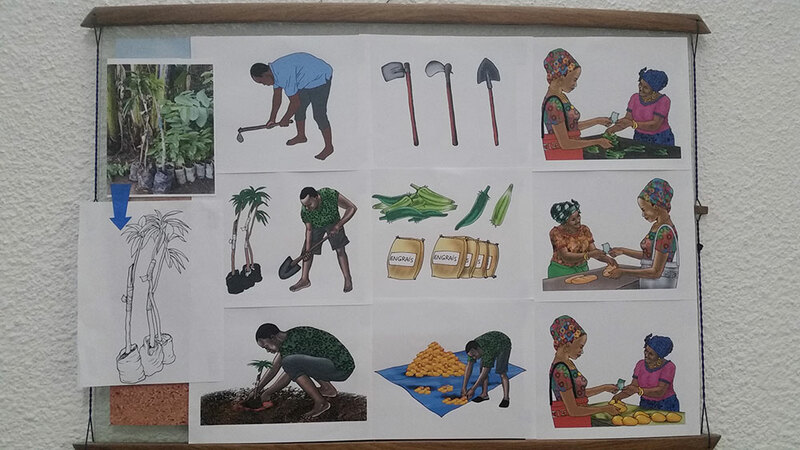 The PTI process involves taking a reference photograph, tracing a line drawing, and using graphic design software to add color, shading, and patterns for a realistic image that is useful in social and behavior change communication visuals for nutrition, health, and agriculture. 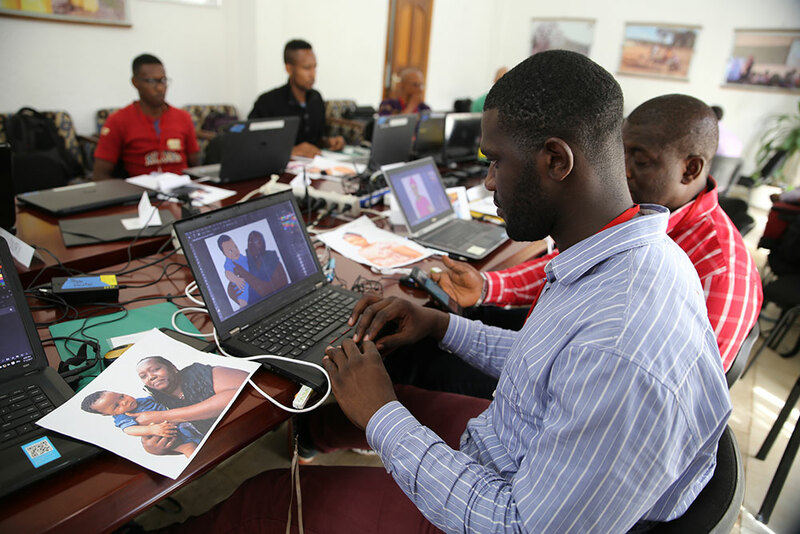 Over the course of six days, participants each converted several photographs into highly-detailed illustrations for SBC materials. 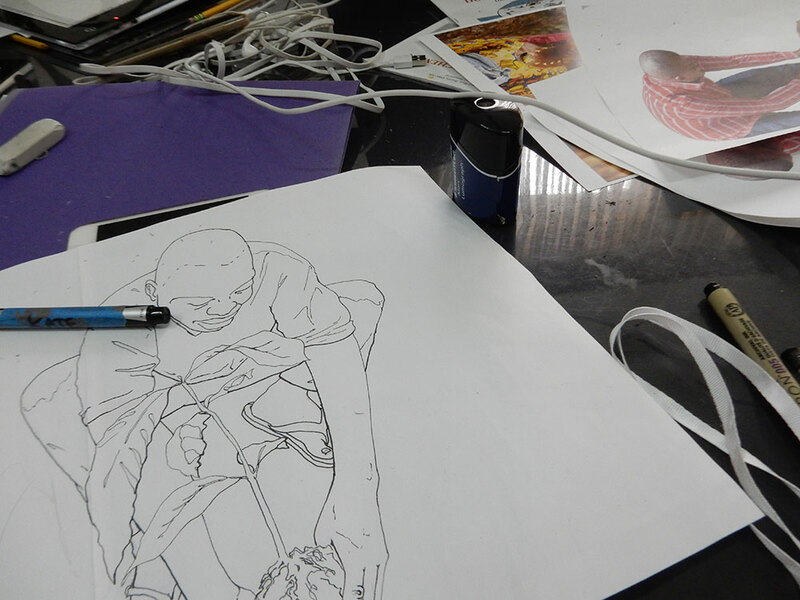 By tracing reference photos, illustrations capture realistic proportions, technical information, and cultural details. 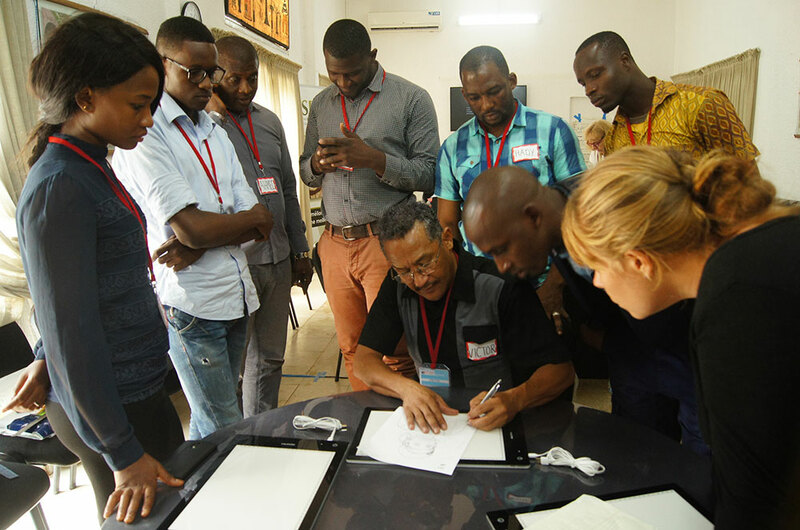 Participants look on as lead trainer Victor Nolasco demonstrates line drawing using a light table. 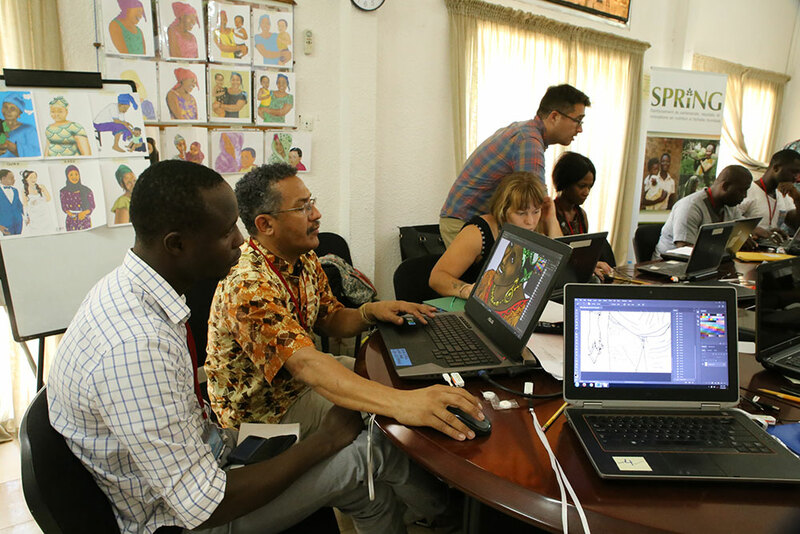 Shekuba Kandeh of HKI Sierra Leone and Ahmed Mansaray of the Sierra Leone Agriculture Research Institute practice line drawings on two light tables. 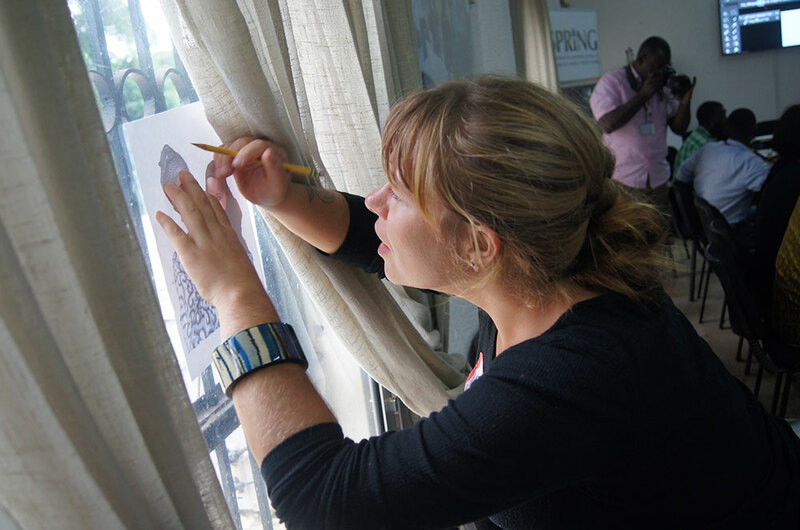 Peace Corps Volunteer Kate Hendrickson demonstrates another effective way to trace: using a bright window! 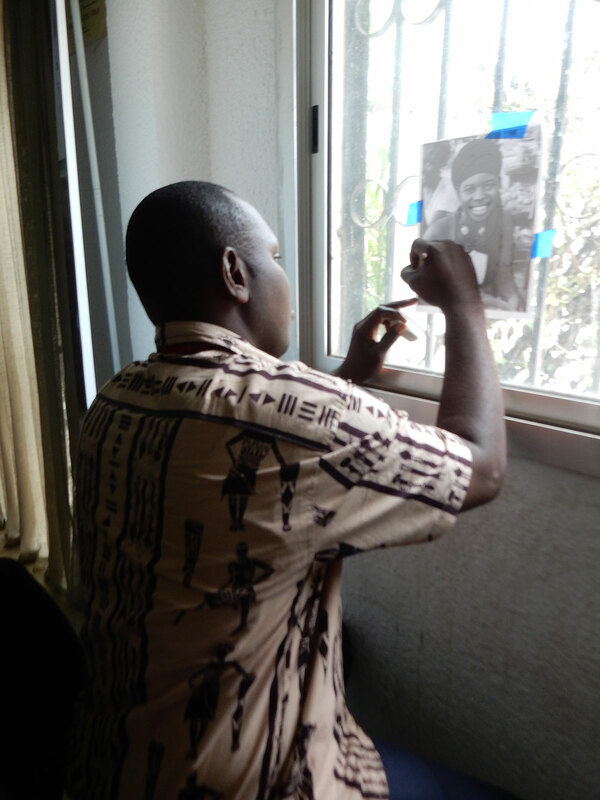 Ibrahima Lansana Kaba of the SMARTE Project of Winrock, International practices tracing in a window. 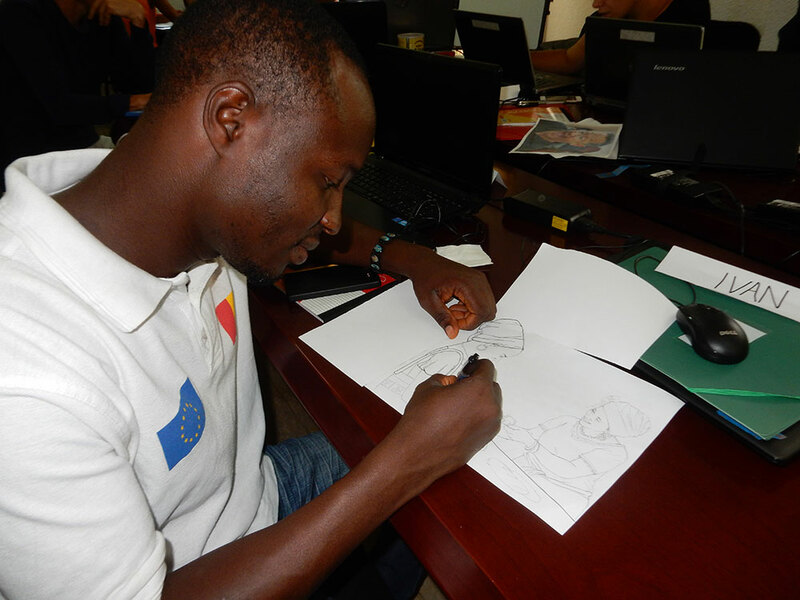 Tiekwei Souomou redraws his tracing in pen to strengthen lines and correct errors before scanning. Victor Nolasco leads a demonstration of refining a line drawing in Adobe Photoshop. 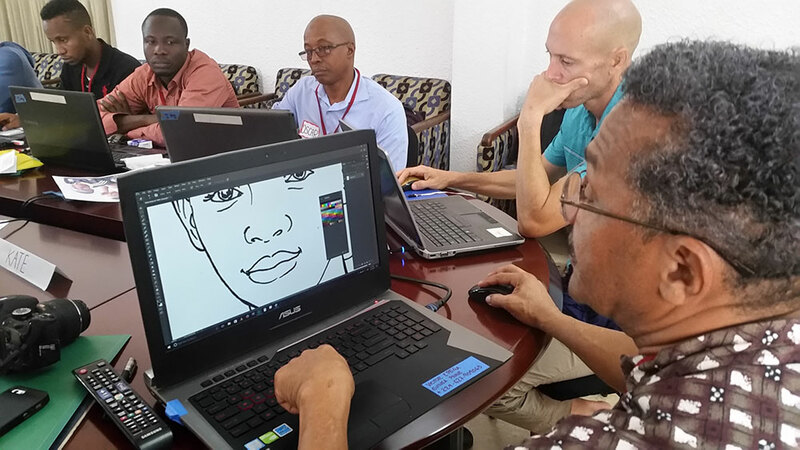 Youssouf Ben Barry Oscar, President of La Bulle d’Encre, practices adding color to a sample image. 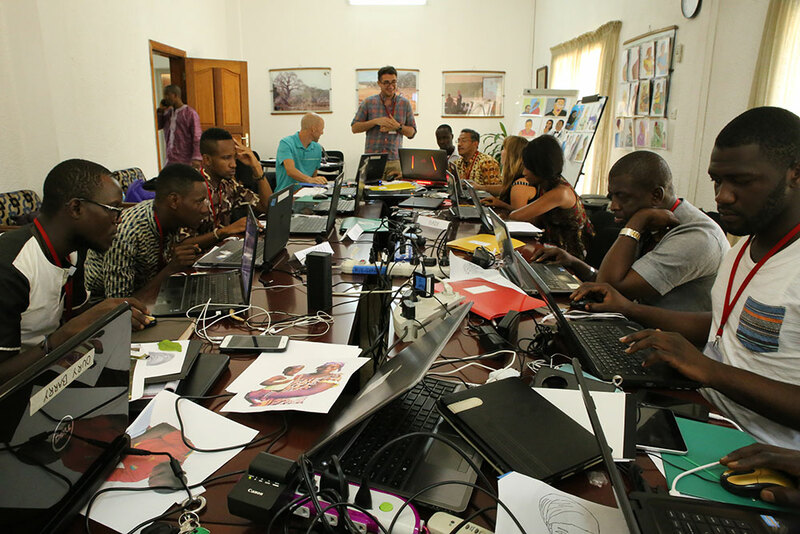 La Bulle d’Encre is a cooperative of 30 Guinean artists who specialize in illustration and have experience creating visual materials for government and NGOs working in Guinea. 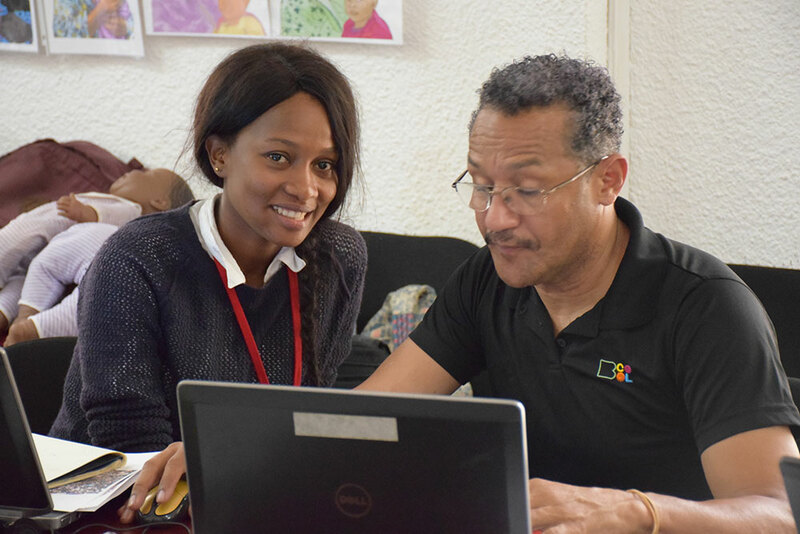 Victor provides guidance to Oury Barry, IT Manager for Peace Corps Guinea, on Photoshop skills. 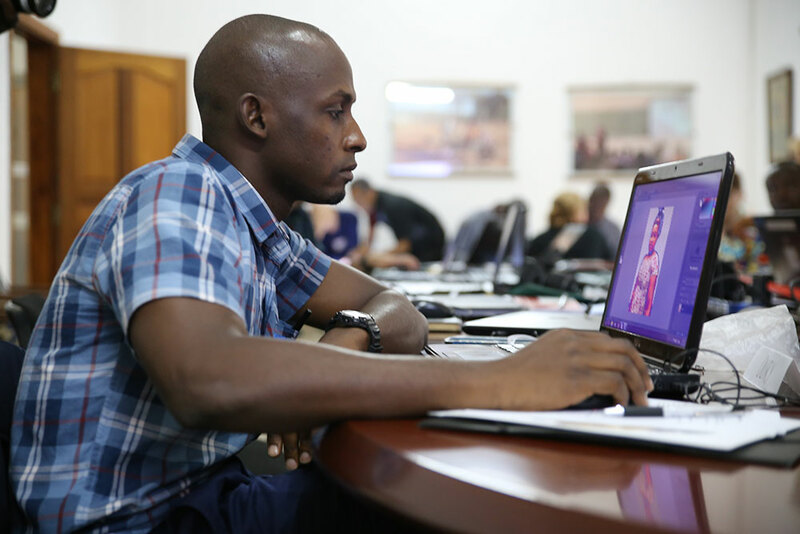 Guinean, Sierra Leonean, and American participants sometimes worked independently on images, but often collaborated to complete different steps of the PTI process. Victor provides Photoshop guidance as Aïssatou Kadè Baldé of La Bulle d’Encre looks on. Tiekwei Souomou of La Bulle d’Encre has his shading work critiqued by Victor Nolasco. Shading adds depth and dimension to an illustration and gives it a professional appearance. 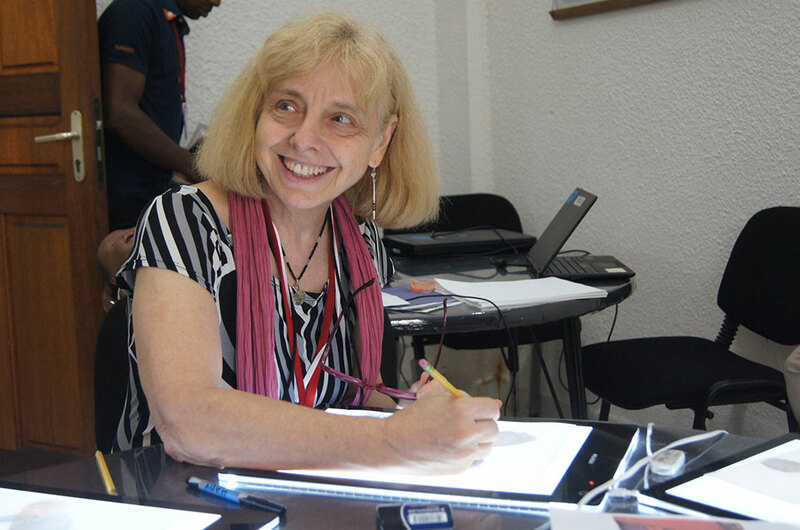 As soon as a participant finished an illustration, s/he rushed back to the light table to start on the next one. 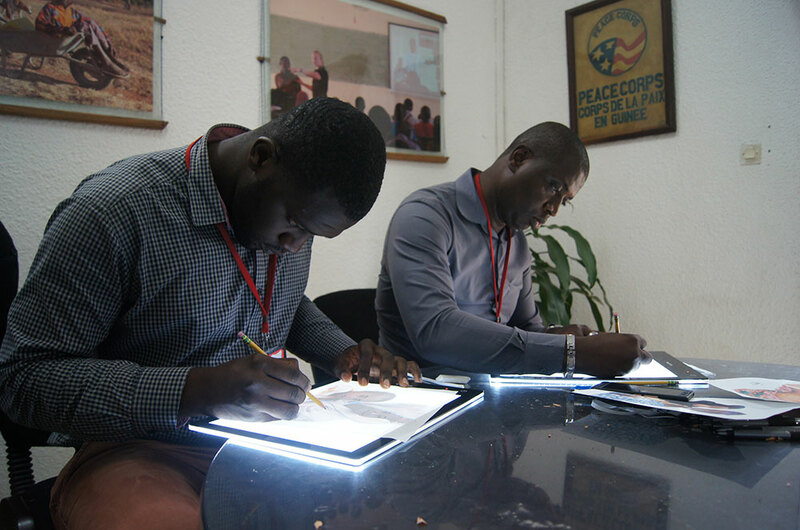 Here, Peace Corps volunteer Justin Hubbell and Victor practice tracing. Oury Barry adds volume and shading to his latest illustration. 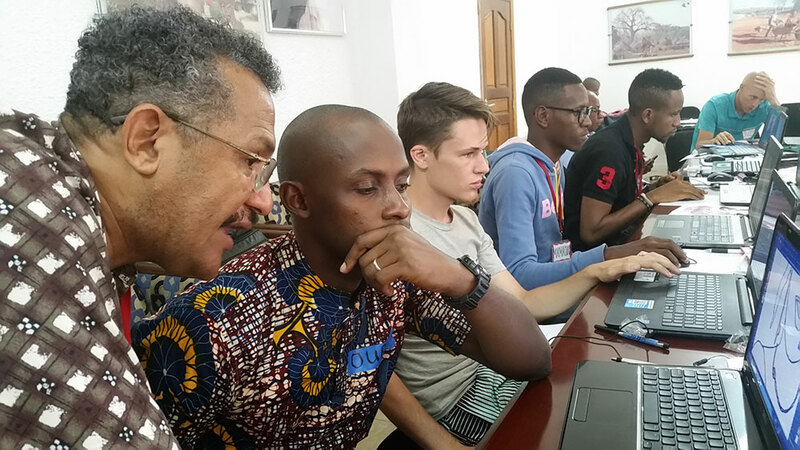 Andrew Cunningham of SPRING and Youssouf Ben Barry Oscar troubleshoot a Photoshop error. For many, this was their first experience with Photoshop. Victor provides advice on developing concepts for illustration and scenes for visual materials to La Bulle d’Encre. 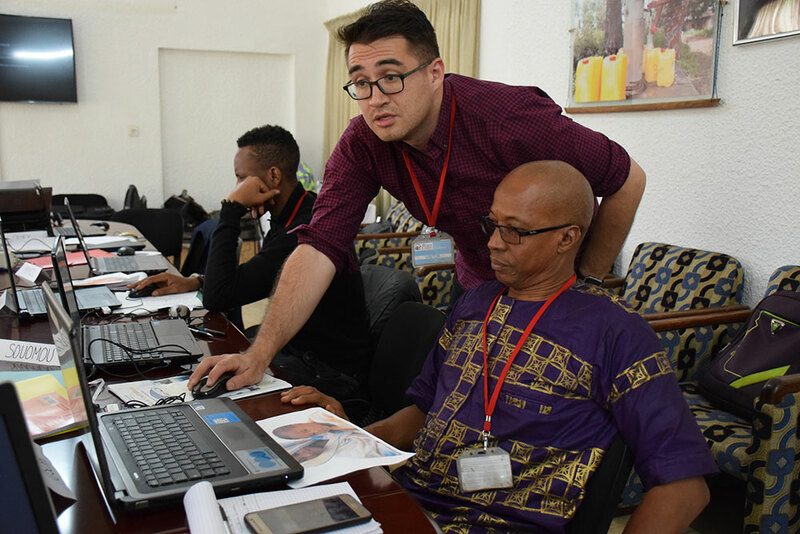 For SPRING partners working in Guinea, La Bulle d’Encre is the newest resource for developing in-country SBC materials. Using the PTI process, teams can create individual illustrations that can be laid out into an image or a series of images that tell a story. These illustrations can also be adapted to fit a new cultural context. 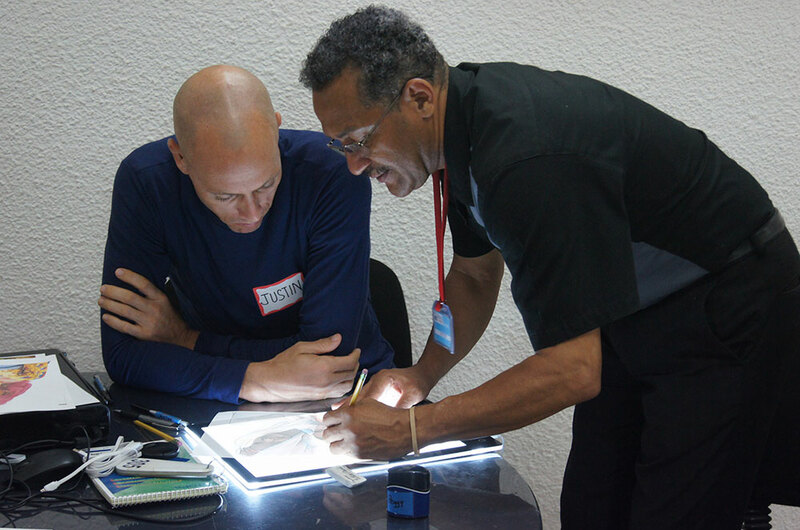 Victor Nolasco has decades of experience in the PTI process, and is always learning more from his collaborators and participants in his trainings. Peggy Koniz-Booher of SPRING tries her hand at the PTI process. 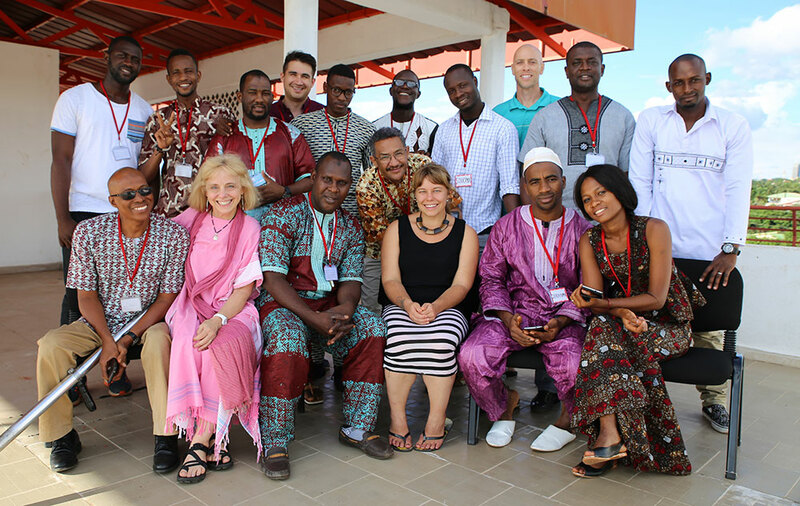 Trainers and participants celebrate a completed training!